When I asked my 12-year-old son to come with me to the Oil and Gas community meeting, my objective was to have him learn a little about civic responsibility, community representation, and to show him how the people in a community can have a great impact on the decisions that are made on a municipal level. Maybe he’d learn a little about energy, the pros and cons of horizontal drilling, and maybe a geology lesson would be wrapped in there somewhere. 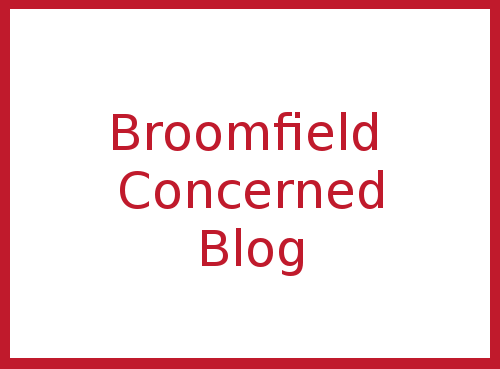 I know for me, the educational process has been ongoing for the past 8 months or so, and while I don’t know everything there is to know about oil and gas development in Broomfield, I try to keep abreast of the relevant developments as they happen. I was hoping to loop him in a little. I’m especially interested in watching how the community (myself included) continues to navigate this difficult space. A friend today described it as “awkward,” which I think completely nails it. It’s awkward to walk up to a fellow community member and hold completely diverging core values about something like “What is safe?” or “What is permissible?” But we go, we have the conversations, and we try to learn how to belong and disagree and still love where we live because we know our voices have power. So, Eliot and I went to the meeting, and I filled him in on some important vocabulary on the way there: setbacks, pipelines, inspections, wells, well pads. We made our way into the community center gym a few minutes after the presentation started. Eliot enjoyed his cookie, and we definitely appreciated the bottle of water. Once the presentation was done, we scoped out which table we might want to start with. Let’s start with one, I said. And so we did. Table 1 was health and safety. I sought out Patrick Freeman, a member of the O&G Task Force, because I heard from a friend that he has an amazing binder full of study after study on health and environmental impacts of oil and gas development. There he was with his binder, so I couldn’t’ resist talking to him. I had also heard that Patrick had done a heap of research on oil and gas accidents like spills, blowouts, and the like. Based on this research, he came up with an ideal setback distance of 2000 feet for the proposal. The proposal that I was holding in my hand, though, only proposed a 1320-foot setback, which is better than the current regulation (kudos!) but not enough in the minds of some (myself included). I asked Patrick why the 2000-foot setback wasn’t reflected in the report. He told me that he “had no support” for that number. I asked, as I often do, “Why?” He didn’t seem to know, I mentioned politics, and he just shrugged. So I walked away without an answer, and I continue to wonder, why? Why not ask for simply the most? Let us ask, and let them say No.This is our community—our neighbors—our children we are talking about. Don’t they deserve the most? Or do they deserve a compromise because an industry wants to develop resources in our neighborhood? What is good enough? We moved on to several other tables, asking questions and learning about things like the water table, how Colorado was once an ocean, and how truly far below us these minerals and resources lie. As I looked at the diagram that the water expert was showing us, I couldn’t help but cringe. These vertical wells punch right through our water table. 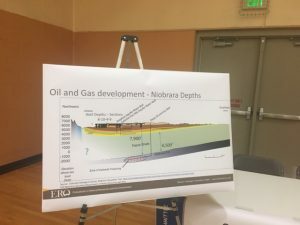 (Extraction has a plan to punch at least 120 vertical wells in the near future, and from the vertical wells, then they go horizontal to get access to the minerals.) The wells are as protected as they could be, I suppose; there is concrete and some metal casings involved. However, these wells are used to inject water with toxic chemicals into the earth about a mile down, and then pipe up oil, gas, and the same toxic chemicals. What happens if the ground shifts—like a small earthquake or something, and a well pipe ruptures? Will the groundwater be contaminated? Yes. Of course, it’s unlikely, but it could happen. What is a community without its water? Do we want to prioritize the resource of oil and gas above our resource of water? How is this even a conversation? And then a small amount of panic started to settle in. I looked at Eliot. He looked at me. OH, we said together. And kept walking. We spoke with some other informative people and learned more about the process- inspection, alternative site analysis, modeling of air quality. While the information was all very educational, that pit in my stomach kept growing. Why did I feel so uncomfortable? Then we reached the Risk, Property Value, and Traffic table. I was, I had realized, desperate to talk to someone about “risk,” and Brad Gibson was the guy. I just pummeled him with questions, some coherent, some total gibberish. By the end of the conversation, it became clear to me that I was terrified of the risk, because even by an expert’s estimation, we could not avoid an accident. The “risk” table and conversation brought the event full-circle for me. What was great about this community event is also what was horribly mis-representative about it: it broke things down to their finer points, as if to say: We have it all under control. People are scrutinizing the details in a way that is completely admirable and praise-worthy. We have chopped up the enchilada into 500 pieces, we know how to address each of the pieces, and that’s wonderful. It’s no small feat. And holy moly– there’s a lot of work to accomplish that feat alone. However, what was and continues only to be addressed in flashes here and there is the true scale of this project. The whole enchilada, so to speak. One image that is burned in my mind is from the diagram the Broomfield O&G Inspector had: Broomfield currently has 96 operational wells. The proposals we are seeing from operators wanting to come in increases this number by upwards of 200% if we count the Crestone application. Can you name an industrial operation that can scale by 200% smoothly in no time flat in the middle of densely populated neighborhoods? What about a mostly outsourced industrial operation? 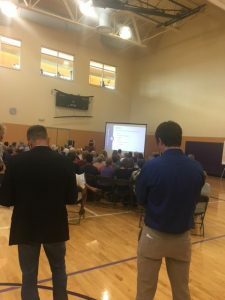 The information—the details– that had been provided to me at the community meeting took into account single well paradigms, because, truth be told, an operation of the size and scale that we are talking about in Broomfield has never been undertaken. Never. Especially never in the middle of a neighborhood. While we can model this and surmise that, I walked away with a feeling of certain dread: we have no idea what we are getting ourselves into, but we have the impression that we are in control of it. If this was a standard, business as usual, single-well operation, I’d be behind it. If this kind of project had been done before—this scale so close to homes, schools, trails, water sources—I’d consider the data and the accidents and the risk. But neither of these are our reality. We are about to become the subject of an epic experiment, and we’re walking willingly into that scenario because we think we understand it. We don’t, because you can’t completely understand something that’s never been done. You can take a risk, experiment, and see what happens. You can fill your binders and present the research available to you. You can mitigate risk and try to predict it, be we all know that human error is too much a factor to truly know what catastrophes are possible. I’m not comfortable with the oil and gas industry experimenting on my community, my children’s air, my home’s potentially plummeting value. As I walked away from that meeting, I was horribly sad for my son and my daughters, who will be on that roulette wheel as we spin it. They will probably be fine, that’s true. But there is a chance they won’t be; there’s a chance they will inhale toxic fumes or be exposed long-term to something carcinogenic or that, even worse, an explosion or spill could harm them irreparably. So what do we do? Step up to the table? Place our chips where we may? How can we live with this, and spin the wheel, and know we might not be so lucky?